In the last decade it was shown that the advantages of microreactor like can be transposed with success to industrial scale (1). The same time LED has become an important energy saving light source in our day’s life. Today we are ready to full fill G. L. Ciamicians demand of a better use of light (2). 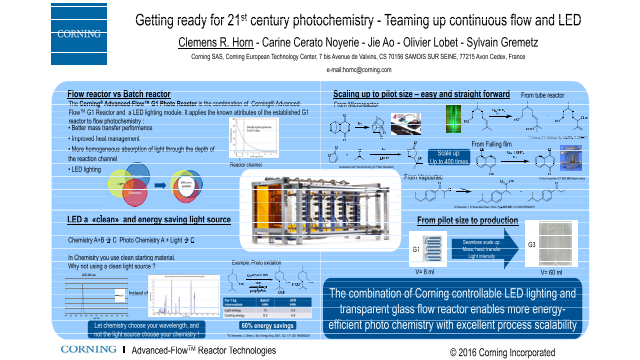 Corning has developed a scalable photo flow reactor with an optimized LED lighting(3). The presented experimental data will demonstrate the various benefits of performing photo chemistry in a continuous way, especially the simplicity of scaling up and enormous energy savings, which are today the main stopper for industrial application. In the case of the photooxidation of citronellol we have achieved more than 60%energy savings compared to the ones of an industrial batch. This example shows the benefits from flow and the importance of the LED matching the chemistry, which was less important with a mercury lamp. Several examples performed in small commercial or homemade flow reactors were scaled (up to a factor of 400) to pilot scale level within a day obtaining the same or better results.